Our Closet Essentials Sale Is Here! 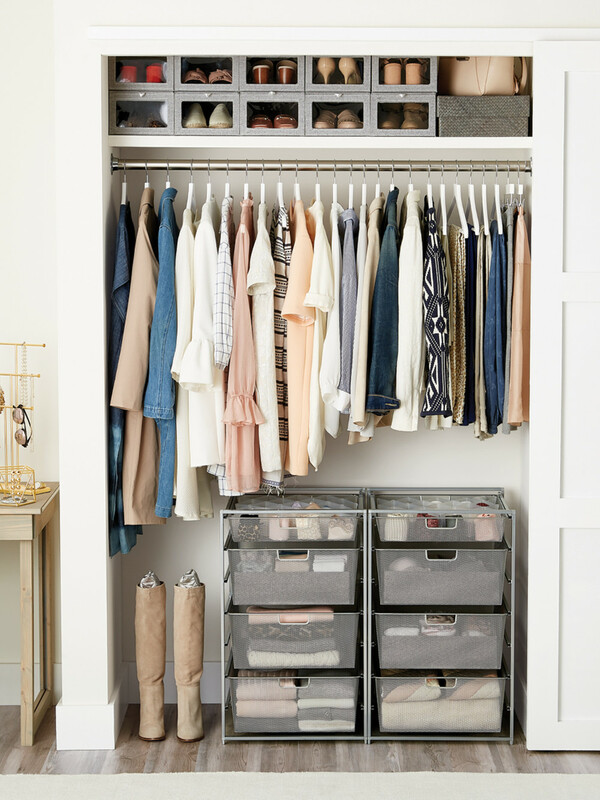 Our Closet Essentials Sale is here, and for a limited time you can save 25% on hundreds of closet best-sellers to help you organize and prioritize the clothes, shoes and accessories in your closet. Not sure where to start saving? Check out a few of our inspirational photos below and click through to shop! 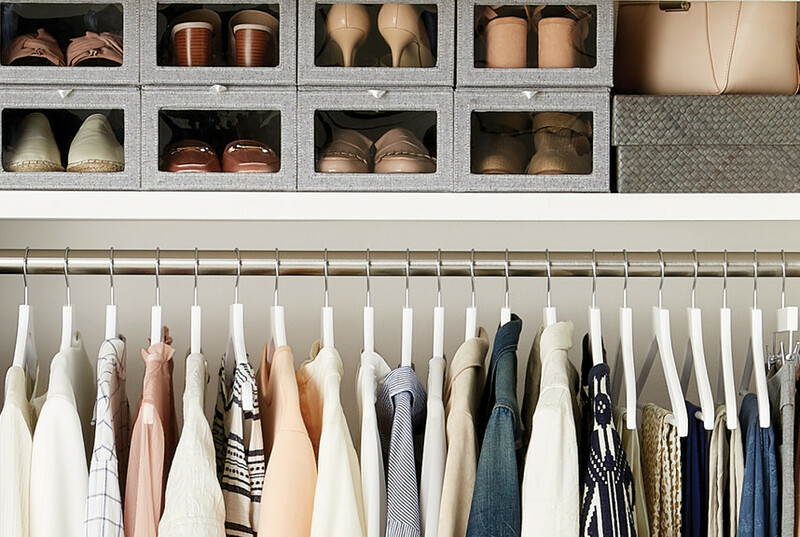 Create space that maximizes what matters with these closet essentials. Amplify the shoe storage with Linen Drop Front Shoe Boxes, choose the right hangers for your specific needs and style and create space-saving storage with a modern chest of drawers from elfa. Shoes take center stage with this layout. 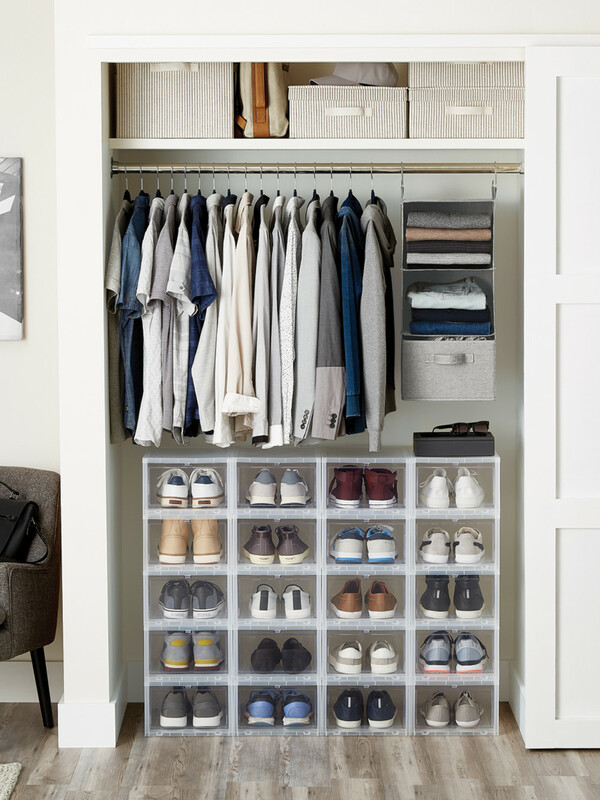 Stack, see and access every pair in seconds with Our Men's Drop-Front Shoe Boxes, while still leaving room for hanging space to store folded sweaters and to hang button ups and sport coats. 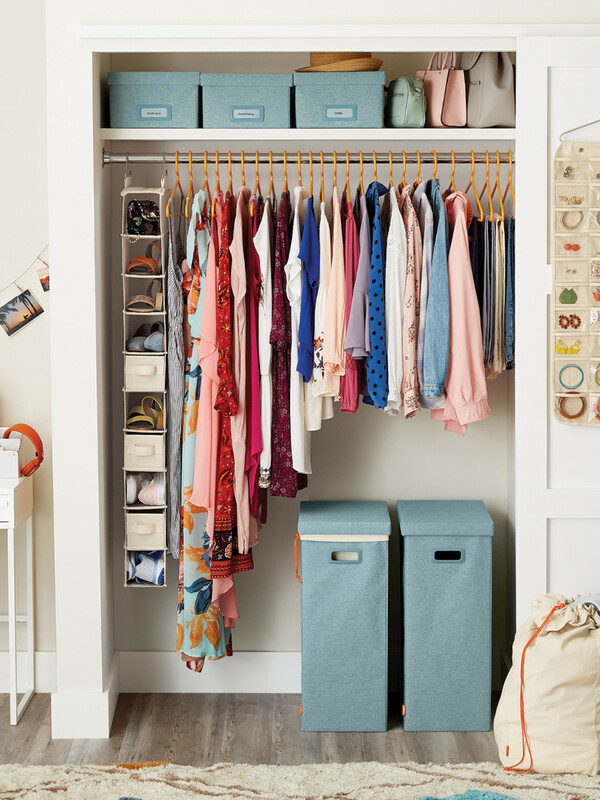 Create more room to grow with a space that opens up to more storage possibilities. Hanging solutions that work for purses and accessories can also work perfectly to store games, toys, books and more. 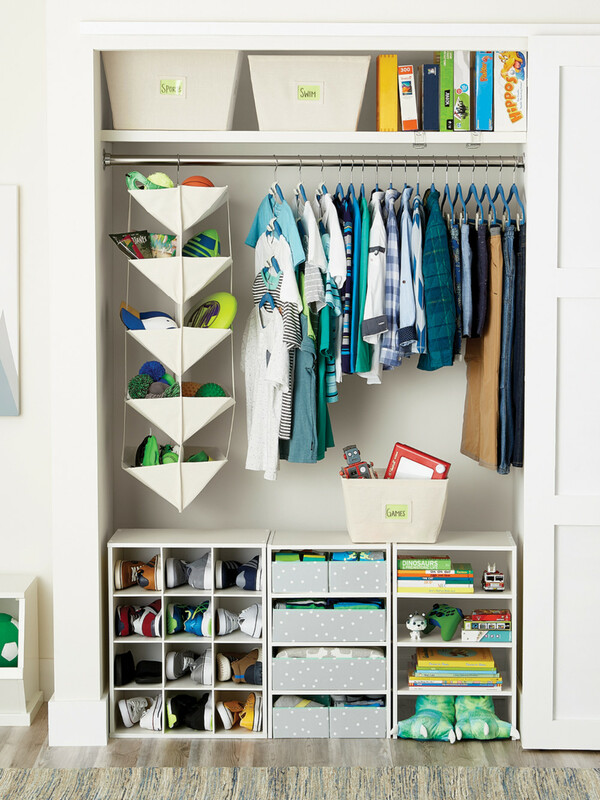 Floor storage makes getting dressed easy for both parent and kiddo. Fit more in with a closet that cleverly uses every inch of vertical space. Using closet rod space to store shoes, accessories and more off the floor and in an easily accessible place. Hanging jewelry organizers keep your collection at eye level and easy to choose from, while handy hampers conceal dirty clothes and still make it easy to take and tote to the washer. Prioritize what's important with this shoe-centric space. 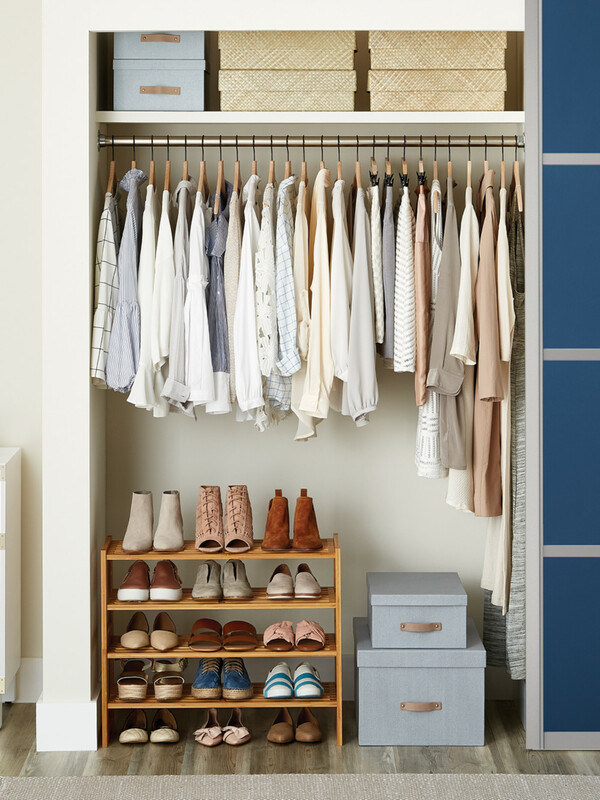 Stackable shoe shelves give you the ultimate personalization for a growing collection, while concealed storage boxes allow you to store seasonal clothing up and out of the way. Shop all of these essentials and so much more during our Closet Essentials sale going on now!